수도권 지역의 인구는 1960년대 이래 지속적으로 증가하고 있다. 특히 서울의 인구는 90년대 들어 정체상태인 반면 수도권 지역의 인구는 지속적으로 증가하고 있어 서울의 교외화현상이 서울시 행정구역을 넘어 수도권으로 확대됨을 알 수 있다. 1980년 이래 수도권의 인구성장패턴을 보면 대개 경인축과 경부축을 중심으로 서울 중심지에서 반경 30Km 권내의 경기 서남부지역에서 인구성장이 높았다. 그러나 90년대 이후에는 고양, 성남 등의 신도시 개발과 용인, 남양주, 광주, 김포 등 준농림지역 개발로 수도권이 광역화됨을 뚜렷하게 볼 수 있다. Population of the Metropolitan Area has been increasing since 1960s. 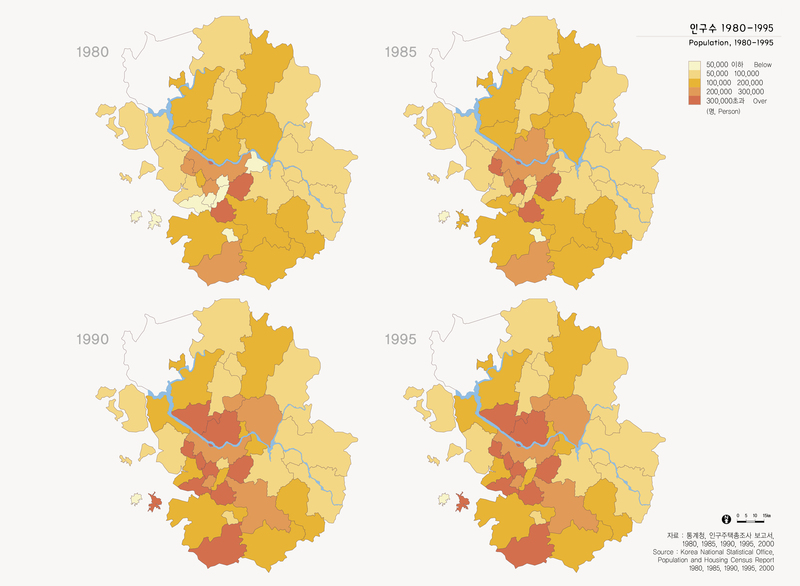 In the 1990s, while Seouls population stayed stagnant, the population in the metropolitan areas continues to increase, which means suburbanization has expanded over the Seoul boundary. Population increases in the metropolitan areas since the 1980s are in the south-western part of Kyonggi-do province within the radius of 30km, along the axises of Seoul-Incheon and Seoul-Pusan, from the downtown of Seoul. Since the late 1990s, the metropolitan areas experienced a rapid expansion due to the developments of new towns in Koyang and Songnam and quasiagricultural regions in Yongin, Namyangju, Kwangju, and Kimpo.